Today we had another wonderful day at the beach, armed with our bucket and spades. Ethan found all sorts of things in the sand, and we decided it would be fun to collect all of these treasures in his bucket. We walked around picking up shells, rocks and sticks and put them into the bucket. 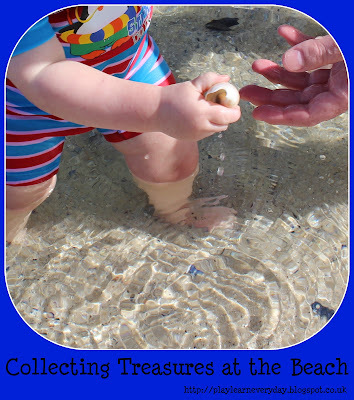 We then put some water into the bucket to rinse the sand off of our treasures. Ethan was fascinated with this process, and with putting his treasures in and out of the bucket of water. He discovered so many things on the beach today, developing his Knowledge and Understanding of the World and having so much fun!